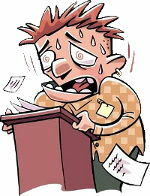 75 percent of people have “glossophobia,” the fear of public speaking. Fear of public speaking can be a really debilitating condition for many people. In fact, for most people, speaking in public is the single most frightening thing in life. Taking second place is the fear of talking about death: For instance, doctors, police officers, and firefighters may have the unfortunate (and daunting) task of informing families that they have lost a loved one. The third thing people fear is… actually dying! It seems that there is no greater level of anxiety than to speak in front of other people. For professionals, public speaking anxiety can be a crippling road-block to potentially successful careers. So in 1995 I began helping working professionals hone and perfect their communication skills. I realized as a consultant and young professor that if I was to succeed as a instructor and coach, I needed to make this crippling fear, public speaking anxiety, the focus of my coaching strategy. I set out to create a program that, from start to finish, was infused with practical techniques that would not only help individuals effectively govern their fear of public speaking- but more importantly- build in them a level of confidence they otherwise would not have discovered and developed. Today, I’m a public speaking professor and the director of one of the most successful speech teams in recent history. The speech training program I developed caters to the communication needs of a diverse array of working professionals in Los Angeles that include CEO’s, CFO’s, lawyers, doctors, dentists, city planners, TV celebrities, engineers, graduate students, entrepreneurs, sales executives, retired pro athletes, and a numerous leaders of the clergy. I have helped thousands of individuals overcome their fear of public speaking. I can teach you how to effectively manage your speaking anxiety with a solid and proven system. While you cannot get rid of those butterflies in your stomach, I will teach you how to get them to fly the direction you want! With a very methodological approach, practical exercises, and careful guidance, I can help you turn your fear of public speaking into positive energy that will enhance all of your presentations… And make you truly confident! Whatever you want to call it, “public speaking fear”, “speaking anxiety”, “glossophobia”, “speaking apprehension”, or the “jitters”- you don’t need expensive therapy sessions or drugs. Just acknowledge your challenge and take the proactive steps to deal with it. With the proper training, you can stand up and deliver a presentation with confidence. A small investment of your time will pay a lifetime of dividends. No longer will the thought of standing in front of your colleagues or a room full of strangers cause you to break out in a sweat or lose sleep. I promise, I can help you overcome your fear of public speaking, as well as ease the pain associated with the anxiety that comes from talking to a group of people.